Bamboo has risen dramatically in popularity for wood flooring for both aesthetic and environmental reasons. It can be regrown very quickly, provides a range of colors and looks, and grows in almost any climate. Bamboo is used in a wide variety of products from t-shirts to toys. There are over 1400 species growing worldwide, and most bamboo (the most common choice for wood floors) grows at astonishing rates and reaches maturity in a mere three years. Bamboo has proven to be a versatile and functional floor choice for homes, offices and other facilities. However, understanding some basics of the construction process can help to make the right flooring choice from the start. Bamboo flooring typically is constructed in one of three different forms: horizontal, vertical or strand-woven (ii). Horizontal and vertical bamboo floors are considered to be engineered products, providing the look of bamboo but significantly strengthening floors by laminating the bamboo to a stronger wood species as a sub-layer. Strand-woven bamboo is considered to be a solid flooring product and is the strongest of the three types of flooring. It also contains lower proportions of potentially toxic adhesives. It is formed under intense pressure that makes it more resistant to moisture changes. If properly harvested and manufactured, bamboo floors can be as durable and strong (or even stronger) than traditional hardwood floors. However, because of the variables, there are some specific moisture content (MC) precautions we recommend. Moisture Meter Settings When installing the flooring, the source and the construction can influence the ideal moisture level for each environment, and the species setting or specific gravity (SG) can vary greatly depending on the manufacturer’s source and process. (It’s worth noting at this point that there is no standardized grading system for bamboo.) Companies like Wagner Meters are working with specific manufacturers to determine accurate settings, but because of the many different factors involved, make sure you check the manufacturer’s recommendation for your wood moisture meters SG settings or SG adjustment tables! Engineered or Strand Woven? If your flooring is an engineered product, it might be necessary to adjust the depth of your wood moisture meter readings to check both the top (bamboo) layer and the subfloor species. Both types of wood need to have reached a balance with the job site in order to prevent moisture-related flooring problems, and to not develop separation problems in the product itself. Environmental Controls (HVAC) Some recommend that those in regions with high humidity not use bamboo floors (i) due to the unpredictable rate of expansion and contraction during the seasonal changes. For installers in these areas, acclimation is crucial! After installation, it is important for homeowners in these areas to carefully monitor room conditions (temperature and relative humidity) to prevent potential problems. Acclimation The best way to avoid problems for any flooring product is to be sure that it has reached equilibrium moisture content, or EMC, with the space in which it will be installed. This is especially critical with bamboo. Unlike most wood floors, it can expand along its length, as well as its width, and strand-woven bamboo can take significantly longer than another flooring to acclimate. The room must be at service conditions, and sufficient time must be allowed to let the floorboards reach EMC before installation begins. Do complete checks with an accurate wood moisture meter, and don’t begin installation until the product has reached a stable MC level. Bamboo does offer both pros and cons as a flooring option for today’s homeowner and installer. However, it is necessary to take into consideration the specific qualities of bamboo flooring in order to avoid moisture related problems. In recent year bamboo flooring has become a popular option among many home builders. It holds a beautiful finish, and adds a unique element to any room. Many people who are attempting to reduce their carbon footprint have also taken a shine to bamboo flooring as it is easily biodegradable. One upside of using bamboo flooring is the renew-ability of bamboo as a resource. It is comparable to many hard woods, such as maple, but grows in a fraction of a time. It could take over 100 years for a hard wood tree to mature to the point where it can be used as flooring. One of the biggest attractions of bamboo flooring in this eco-conscious age is the biodegradability. Between its rapid growth, and the fact that it break down easily after being replaced, it is often seen as a better alternative to destroying trees that take hundred years to grow. if bamboo floor is used for ocean container, will the high humidity in environment affects the moisture level in bamboo floor? Anytime bamboo is placed in an environment that is higher or lower in relative humidity, the bamboo will try to equalize to the ambient RH with a higher or lower moisture content. This will also cause corresponding changes to the bamboo’s physical dimensions. The moisture content of the bamboo can be calculated with the tool located at http://www.csgnetwork.com/emctablecalc.html. What would be the optimal MC for a bamboo cutting board or bamboo utensil? Bamboo is normally dried to a point where it is in equilibrium with the atmospheric moisture content or relative humidity. Typically, this moisture content (MC) is around 8%. How do you deal with a sliding glass door and condensation buildup at the metal base and the bamboo flooring after it has been installed? This problem could also be related to the type of door if it is a single pane type. If the door is doubled paned, the seal, either between the panes or around the frame may have failed. My bamboo floors have bubbled to the point where 3 full boards have raised in the MIDDLE of my floor. I’ve had a dehumidifier going all summer, but the boards still haven’t come down. I’m sure they’ll go down once winter hits, but is there anything else you’d recommend in the meantime to get the moisture down? I’d love to get them down and re-glued asap. My current dehumidifier says we’re around 55% humidity. I’m in a condo and don’t have a fireplace. Perhaps just get some big ole’ dryers and blast the impacted area? It sounds as though your floor may be buckling due to a high moisture problem. This can be caused by a leak or a wet slab. The best way to check for this would be to use a moisture meter to trace the area of moisture and track down the cause or source of it. I would recommend calling a certified flooring professional from your area to help with this issue. They can help find the cause and either do the repair or refer you to someone that can do the repair. 2. The floor is noisy / squeaky when walked on. Our house is not damp but the builders did plaster walls after installing the floor. The bamboo flooring was laid on a thin layer of foam ontop of tiles and floorboards (which don’t squeak). Can you offer any advice as to the probable causes of these issues & how we / the builder can rectify them as we love the flooring. For your first question, the likely cause is due to a high moisture problem. This can be caused by a leak or a wet slab. The best way to check for this would be to use a moisture meter to trace the area of moisture and track down the cause or source of it. It may be best to get a certified flooring inspector or specialist there to diagnose and suggest a solution: https://www.nwfa.org/cp-inspector.aspx. The answer to your second question may be related. I have heard of a number of cures for squeaky floors; screw and nail fastening systems (not for a floating floor), talcum powder, or even WD-40. You can find many of these fixes on YouTube. I have heard of a number of cures for squeaky floors; screw and nail fastening systems (not for a floating floor), talcum powder, or even WD-40. You can find many of these fixes on YouTube. It is too bad that many flooring companies will not take responsibility for correcting issues caused by them or a lack of fully checking to truly see if the site of the installation is ready. The question of whether the floor can be resurrected is one that can only be answered by an on-site flooring expert. I recommend that you have a certified flooring inspector come out and look at your floor. The National Wood Flooring Association (NWFA) would be a good place to start. Their website, https://www.woodfloors.org/why-nwfa.aspx is a good source to find an NWFA certified inspector or contractor to help you answer your question. My Christmas has ruined my bamboo floors due to water damage. Will it go back to normal once it dries up or do I have to replace my floors? Help, so devastated! Depending on the type of bamboo, how much water was involved and the length of time the water was present are all factors that will determine if the floor is going to rebound back or need to be replaced. Recently had bamboo flooring installed. It looks beautiful and I was very pleased with it – initially. I believe the VOC’s in the resin are making me sick. Is there anything that can be done to eliminate this problem, short of having the flooring removed? I purchased an air scrubber that advertised removal of VOC’s but to date that doesn’t seem to be working. Thank you for your attention to this matter. I’m desperate for an answer to this problem. There have been many improvements in manufacturing quality to lower VOC’s and the use of formaldehyde but these practices do not apply to all bamboo flooring. Some manufacturers are very diligent when it comes to ensuring the bamboo flooring they sell is low VOC and formaldehyde free. Check to see if the flooring you had installed is California Air Resource Board (CARB) compliant. A certified flooring inspector may be able to help and make recommendations for resolving the issue. Please check out https://www.nwfa.org/cp-inspector.aspx to locate an inspector in your area. Tony hope all is well, I am thinking about installing a solid Bamboo floor in my living room. The bamboo will be installed over a plywood and with an under layment. I was advised that living in NJ where the humidity can by high at times that the bamboo floor has a high probility of it warping. Have you heard of this issue ? 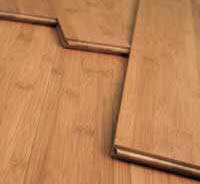 To enjoy a long lasting floor, bamboo, like wood flooring, just needs to be properly installed and maintained. In order to have any floor last, there are certain conditions that need to be met. 1. Choose high-quality floor, price is not always an indicator of quality. 2. Acclimate as long as possible, and use a moisture meter to check moisture content of the flooring and sub-floor. 3. Leave adequate expansion space. Floors will expand or contract as RH levels rise or fall. 4. Maintain consistent humidity levels throughout your home. Any wood or bamboo flooring will expand or contract with varying RH levels. All flooring manufacturers will require RH levels be maintained within a certain range in order to validate the warranty. Check with them for the range (typically 40%-60%). It would be a good idea to have a thermos-hygrometer to check the temperature and RH. I am looking for a floor to install throughout my condo. I am on slab, wall air conditioners and baseboard electric heat. My humidity level throughout the year stays between 26% and 28%, which is very comfortable for me. I sell flooring for a living, so I know wood is not an option. I was considering 12 mm laminate flooring until I came upon a 3/8″ x 5 1/8″ locking engineered woven bamboo. Any thoughts on my 2 choices? Based on your relative humidity (RH) levels, and assuming the RH stays constant throughout the year, the flooring will equalize to between 5.5% and 5.9% moisture content (MC). This is very close, or at, unacceptable levels in regard to RH and MC for engineered floors, depending on the manufacturers’ warranty specifications. The same information I have listed above hold true for stranded bamboo. The best advice I can give is to get some samples (full size if at all possible) of the flooring types and place them in your home for a period of time (1-2 months would be ideal) and see if any issues with the flooring arise. We have Cali bamboo on the lower floor of our house. I have cleaned the floor with the recommended product and any other product I can think of. As soon as the dog or a person walks on the floor, their footprint shows up……everywhere they walk! I admit that I am a clean fanatic and am ready to replace this one year old flooring. I appreciate any recommendations to get rid of footprints! We just had some minor flooding occur and some water has seeped under our bamboo flooring. Is there anything we can do? Usually, the floor will cup when water gets under the flooring. In most cases, as long as the flooring is not permanently damaged, the floor will return to its original state. This may take some time, weeks or even months, so be patient. If the floor does not return to its original size and shape, then a flooring company should be contacted to see if the floor can be sanded and refinished. We are replacing our wood floors and are I think we are ready to purchase solid bamboo wood floors. However, we were just told that in our humid climate (Orlando, Florida) this may not be the ideal material to use and maybe we should look at some engineered options. We plan to do a moisture check and to let the wood acclimate for as long as is needed, but we do not want to spend all this money to install the floors for them to crack or expand/contract and leave spaces. I am reading conflicting things online but it seems that since we are almost always humid here it should be OK as long as we acclimate it. Is that correct? I would prefer not to go engineered if I can help it as I have found a product that I like the color and width and it is currently on sale for a very good price but I want it to look nice for years to come! Thanks! The best way to answer your question is to contact the manufacturer of the flooring you want put down and get their recommendation. They can make a good recommendation for the best one depending on the flooring type, horizontal, vertical, stranded, or engineered. The next best method would be to contact some of the flooring professionals in your area. They know the climate and geography, so can give you an educated recommendation on the pros and cons of bamboo flooring. Since the plank is near the refrigerator, there may be water damage to the finish of the plank. If the plank does not need refinishing, you may be able to re-seal the plank. The first step would be to clean the area with a cleaner that is compatible with the type of finish on your floor. The next step would be to apply the sealant with a lamb’s wool applicator, applying a light, even coat. Again, the sealant must be compatible with the type of finish on your floor. Since the flooring came from Lumber Liquidators, it may be difficult finding out what finish was applied to the flooring. The alternative might be to contact a local flooring professional to get an estimate on repairing the damage. They should be able to tell you if the area can be refinished. Hi Tony, we picked out Cali Bamboo flooring , we decided to put down the Cali bamboo, was told we needed to put the flooring in the house to acclimate at least 7-10 days we had it delivered and they stacked it into the living room the night before it was to be installed the flooring company called to say they could put it down because it was not waffled and the installer would come the next morning and “waffle” it and it had Twitter like that another 6 days , we had it in the living room for 16 days , is this common? Thanks for the question. There really isn’t anything “common” about wood flooring acclimation. Depending on the conditions where the wood was stored and/or the conditions where it is being installed may vary the time necessary to acclimate. One thing you don’t want to do is rush acclimation. I would have this discussion with the installer in an effort to better understand the process. In the end, moisture tests on the wood flooring, periodically, should be being done to monitor the progress. Good luck.